Today's Draw: The Magician from the Mini Bohemian Gothic Tarot by Baba Studio. Do you think you'd be a good leader? Can you handle the power responsibly? What do you think goes into making a good leader good? 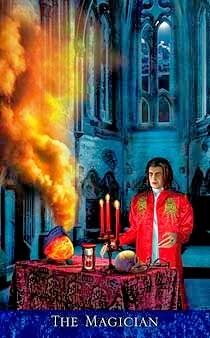 The Magician has the power and the tools to create any reality in his world. Because the Bohemian Gothic is a deck often used to explore the dark side of things, this card makes me think of what happens when you misuse your power or use your tools and abilities for ill. I have some really particular views about people in power. See, my dad was a Major General (a two-star general) and he was in charge of one of the Air Force's larger commands. He had a lot of people working for him. He carried a lot of sway in the military. And, first and foremost, he led fairly and with integrity. There is an award given by non-commissioned officers (like those with the rank of Sergeant) in the Air Force called The Order of the Sword. My dad is #61 on the list on Wikipedia. This isn't an award that is automatically presented each year. You only get it if the people in "the cheap seats" consider you a great leader. It's completely discretionary. It comes from the heart. And because of that, my highly decorated father, a veteran of three wars, coveted this distinction most of all. The military can be a very insular environment. When you live on a base, it's like living in a small town. And when most of the people in that small town work for your father, you learn that prominence and leadership carry a certain responsibility. You live in a fishbowl. Everyone has eyes on you and so an officer's reputation and integrity ride along with that of his/her family. In fact, in order to even make General or gain a major command, you must have a wife worthy of the role of "first lady" and a family that's not going to embarrass the Air Force. It sounds dramatic. But anyone who has lived that life will tell you I'm not over-stating this. At least this is the way it was in the 1970s. So the idea of responsible use of power is in my blood. Power carries responsibility. It shouldn't be coveted. It shouldn't be used to advance personal agendas or vendettas. It shouldn't be used for manipulation. It should be used to lead. And if you're going to be a leader, you should be a role model to all who count on you or follow you. You shouldn't lead by virtue of your weaknesses, but by virtue of your strengths. And you should be conscientious enough of your weaknesses to either work on them or keep them out of your role as leader. You're not there to make friends or be popular, but to inspire others to be better people—not through force or fear, but by example. This is how I was raised. It sounds like a pretty stiff order, but that's who my father was to his people and to the country he served. He was nowhere near a perfect man. He of the sometimes mismatched socks wasn't even a perfectionist. But he was a damned good leader....someone to look up to. Someone who inspired. Someone who took "duty, honor and country" very seriously. I can only remember him having maybe two or three friends in my lifetime, though he was the friendliest man you'd ever meet. He knew that leadership was more about earning respect than being popular. Which is why an award given by those with the least power meant the most to him. So I'm tough. I admit it. The way a leader conducts themselves is more valuable to me than what they're able to accomplish. Both are very important. But I measure a person more by how they carry themselves through life than what they're able to achieve in it. I had a long conversation about responsible leadership today, in fact, with someone I admire as a spiritual leader. We discussed how the further you progress as a leader, the lonelier it can be and the heavier the mantle you carry. See, if you're going to be a spiritual leader, you can't gossip behind the holywater cooler with your students. You can't indulge the darker aspects of your personality with them. You can't use them to further your personal agendas. Moreover, they don't have to practice what you preach, but you do. And to teach from a place of knowing, you have to be further along the path than your students. You lead by example. That's why it's lonely. That's why it's hard. Everyone makes mistakes, but because yours are magnified by your role, you have to try that much harder. Not all leaders get that. Some are good at inspiring others, but lack character. For example, Osama bin Laden has often been described as charismatic and inspiring, but he led from a place of hate. Hitler got entire nations to support him, but he used that power to advance his personal agenda. Nixon's ego, short temper and desire to undermine his adversaries did him in. The world is full of powerful people. But it lacks good leaders. With power comes responsibility and those who fail to take that seriously eventually seem to fall. Today's draw comes to remind us that every Magician has a dark side. But their magic isn't measured by the amount of power they wield. It's in the amount of light with which they wield it. Exquisite post on leadership. Your daily draws have become my favorite read of the day and I especially like that your posts are always grounded in the world we live in despite the fact that they deal with such an esoteric subject as tarot.